Are you looking for a more compact way to remember your family member or friend? 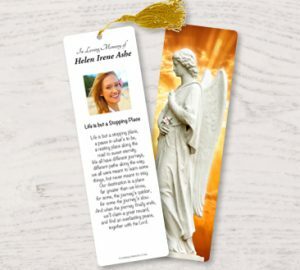 We offer 2.5 inch by 4.25-inch prayer cards for funerals, memorials, and wakes. Our custom option is 3 x 4.5 inch and you can use your favorite photo for the front. Available in over 75 designs, including religious, military, and sports themes. We have a list of the most popular memorial poems and funeral prayers on our blog, including the fisherman’s prayer, religious verses, and non-religious sentiments.